This website is dedicated to Serbian medieval coins study and research, especially King Radoslav coins which are first, rarest and most valuable Serbian medieval coins today. Please use references page for any coin identification purposes. All comments and any additional material is welcome. Please check King Stefan Radoslav page we have 3 coins there for sale. These coins do not come on the market very often. It is remarkable to find 1 on sale but we amazingly have 3 available. There are only another 30 King Radoslav coins known to exist in the world. They are extremely rare as this Serbian king only ruled for 5 years in the first part of the 13th century. Below are some files, books and research free to download. 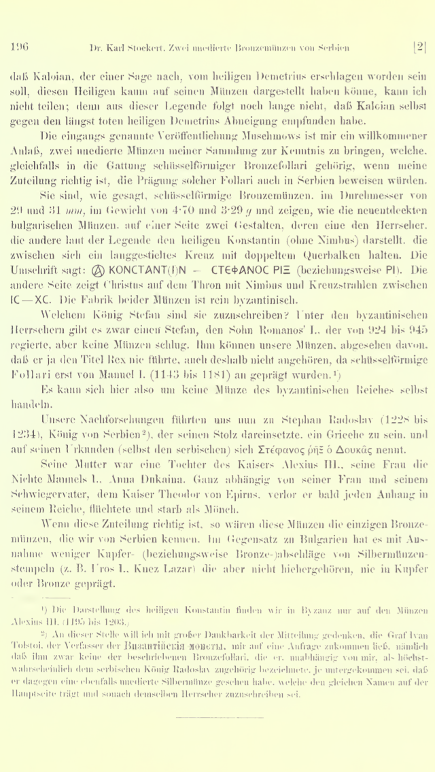 Following research shows 33 known King Stefan Radoslav coins from the first two published by Dr Karl Stockert in Vienna in 1914 to the latest ones sold online and privately between 2012 and 2019. So over 100 years of publishing history. Among the above only known 32 King Radoslav coins we can differentiate “double cross” or ”banner” type, first 8 pictures where all coins seem to be made of copper using same die. Then “saint blessing the king” type, next 12 pictures with at least 5 different dies of which first 6 seem to be made of copper and following 6 of silver. First 2 pictures, which is same coin of “double cross” or ”banner” type has legend CTEФANOC PIZ on the left and KONCTANTH on the right side. Then “saint blessing the king” type with CTEФANOC PIZ legend on the left side only, 3 silver coins have CTEФANOC PIZ ДUKAC signature on the left and OПANTOKPATOP on the right with the exception of the coin no14, having isolated P. 2 coins no31 and no32 have obverse legend CTEФANOC PIZ MP O8 and reverse legend IC XC O EMAN8NA (Jesus Christ Emanuel). All in all there are 19 “double cross” or ”banner” type copper coins, 9 “saint blessing the king” type copper coins, only 3 “saint blessing the king” silver coins and 2 copper with Jesus biblical name Emmanuel meaning "God is with us". Coin no1 is the first published King Radoslav coin by Dr Karl Stockert in Vienna in 1914, its 31mm, 3.29g. Same coin 2nd picture appears in Miroslav Jovanovic book Serbien Medieval Coins published in Belgrade in 2002 as 4th coin listed on page 13 but claims that coin is 30mm and 3.26g. Coin no2 is coin published by Rastislav Maric in the book Studies of Serbian Numismatics in Belgrade in 1956. Mentioned by Dr Karl Stockert in Vienna in 1914 as being 29mm and 4.7g. Coin no3 was sold on eBay in 2014 for around £650. Coin no4 was published by Vujadin Ivanisevic in his book Money of the Medieval Serbia in Belgrade in 2001 listed in the book as 4th King Radoslav coin. Found in the area of the Fortress of Ras, see reference work below. 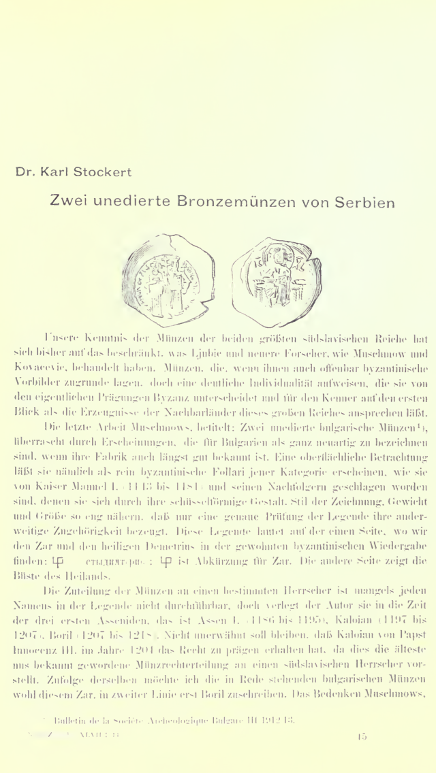 Coin no5 was published by Sergije Dimitrijevic in his book Medieval Serbian Coins in Belgrade in 1997 page 19. Coin no6 was sold on cngcoins.com auction website for $2700 plus buyers auction fee which is normally 20%, its 32mm, 3g. It came back on sale November 2018 with auction ending January 2019 on the same website. It has sold again for $3250 plus 20% auction fee which is $650 ending with a $3900 price tag. Coin no7 was sold on www.rudnik.com website for $1125, its 2.93g. Coin no8 was published by both Vujadin Ivanisevic in his book Money of the Medieval Serbia, Belgrade, 2001 listed in the book as 3rd King Radoslav coin and Sergije Dimitrijevic in his book Medieval Serbian Coins, Belgrade, 1997 page 18. Found in the area of the Fortress of Ras, see reference work below. Coin no9 was published by Miroslav Jovanovic in his book Serbien Medieval Coins published in Belgrade in 2002 as 3rd coin listed on the page 13. Coin no10 was published by Vujadin Ivanisevic in his book Money of the Medieval Serbia, Belgrade, 2001 listed in the book as 2nd King Radoslav coin. Coin no11 was published by Rastislav Maric in the book Studies of Serbian Numismatics in Belgrade in 1956. This is a coin used on mobile phone card Telekom Serbia. 28mm, 2.67g. Coin no12 was published by both Miroslav Jovanovic in his book Serbien Medieval Coins published in Belgrade in 2002 as 1st coin listed on page 12 and by Vujadin Ivanisevic in his book Money of the Medieval Serbia, Belgrade, 2001 listed in the book as 1st King Radoslav coin as well as on National Serbian Museum website in Belgrade www.narodnimuzej.rs. 29mm, 2.55g. Coin no13 was sold on www.limundo.com auction website in 2015, 26mm, 4.7g. Its currently owned by us and its available for sale at King Stefan Radoslav page. Coin no15 was sold on Numismatik and Naumann auction website in 2017 for 2400 euros. 29mm, 3.22g. Coin no16 was found in Raska area and sold in Vienna in 1996 for 10000 schillings which at the time of introduction to euro currency was around 725 euros. Second picture is original condition that coin was found in. Coin no17 was sold on Stacks and Bowers auction website in 2009, 3.88g, 31mm. Coin no18 was sold to private collection, 2.73g, 29mm. Coin no19 was sold to private collection, 2.62g, 30mm. Coin no20 was bought for 1100 euros from private collection in 2018. Coin no21 is currently owned by us and its available for sale at King Stefan Radoslav page. Coin no22 was sold to private collection in 2018. Coin no23 was sold to private collection in 2018. Coin no24 is currently owned by us and its available for sale at King Stefan Radoslav page. Coin no25 was also sold to private collection. Coin no26 was also sold to private collection Jan 2019 for 1400 euros. Coin no27 was identified by Vujadin Ivanisevic in the publication The Collection of Works by Byzantine Institute 1998, see reference work below. Coin no28 was identified by Marko Popovic in the publication The Fortress of Ras 1999. Found in the area of the Fortress of Ras, see reference work below. Coin no29 was also identified by Marko Popovic in the publication The Fortress of Ras 1999. Found in the area of the Fortress of Ras, see reference work below. Coin no30 was also sold to private collection. It is possible that coins 20-26 and this one are coming from so called Skadar lot found around Skadar Lake area. Coin no31 is published by Sergije Dimitrijevic in his book Katalog of the Serbian Medieval Coins 2001 page 1 listed in the book as 2nd King Radoslav coin. Coin no32 is published in Numizmatički Časopis Dinar Broj 1 1996 page 8. Coin no33 is published by The Barber Institute of Fine Arts Birmingham in Coins Catalog 2007 page 36 and also mentioned inNumizmatički Časopis Dinar Broj 28 2007 page 22.